Many people have sciatica, you may have heard someone say, “my sciatica is acting up.” Sciatica is actually a description of the symptoms experienced when the sciatic nerve or it’s roots become irritated. It is a group of sciatic pain syndromes. Sciatica is kind of the Thoracic Outlet Syndrome of the lower limbs. The tingling, numbness or pain can go from your low back all the way down the leg, or it can be fairly mild and just be in your back. 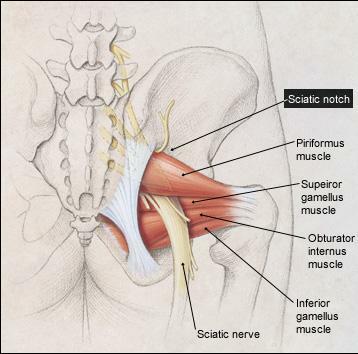 Your sciatic nerve is actually a large bundle of nerves from your low back that travels through your pelvis, out through the sciatic notch and between the piriformis muscle and the other deep hip rotating muscles. When this nerve bundle becomes irritated or “pinched” pain ensues and can be present any where the nerve goes. The actual diagnosis of Sciatica would mean that the nerves are “pinched’ at the nerve root specifically due to a spinal condition. Degeneration, disc herniation, joint dysfunction, inflammation, etc. may cause this. However the nerve can be “pinched” in places other than the spine. Though they are technically termed pseudo sciatica there is nothing pseudo about the pain. The only real difference is where the nerve gets irritated. Piriformis Syndrome can cause similar symptoms to sciatica because the same kind of thing is happening. The sciatic nerve travels through the muscles, if they are abnormally tight then the nerve can become “pinched” and cause sciatica. Sacroiliac Joint Pain is another diagnosis that can cause pain similar to sciatica. Though the nerve does not actually pass through the sacroiliac (SI) joint it does travel close enough that problems in this area may affect the nerve. Problems in the SI joint its self can also cause symptoms that mimic sciatica in that there can be pain all the way down the leg. The cause of your sciatic pain is very important because it dictates how it should be treated. Your chiropractor is trained to correctly diagnose and treat the causes of these painful syndromes. Many treatments may be effectively utilized by your chiropractor, from manipulation to decompression to physiotherapy and exercises. You can do many things at home to help to. Piriformis stretches are useful, and even if the symptoms are not due to your piriformis it may be tight and adding to the problem. Talk to your chiropractor if you are having sciatica. This entry was posted in Chiropractic in General and tagged Chiropractic, Chiropractor, leg pain, low back pain, piriformis, sacroiliac joint, sciatic nerve, sciatica, SI joint on November 10, 2008 by cmnacnud. I actually jut had great results with a patient that was dignosed with piriformis syndrome and was treating for quite some time at other offices for this condition and he was not getting. After I performed a thorough examination it was my opinion that the true cause of this person’s pain was a disc herniation. After a few sessions of lumbar spinal decompresion his pain totally resolved. So please make sure you always get a thorough evaluation by a Chiropractor.